The award also recognizes the positive, significant economic impact the McGowan Institute for Regenerative Medicine has had within the western Pennsylvania region. Under Dr. Wagner’s direction, the McGowan Institute is a leader in medical device commercialization and regenerative medicine technologies. The institute has made an international impact on healthcare with its development of circulatory assist devices, pulmonary assist devices and extracellular matrix-based materials for regenerative repair and healing. 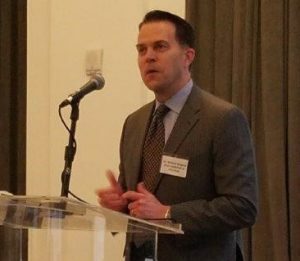 In addition to leading the McGowan Institute for Regenerative Medicine, Dr. Wagner also co-founded Neograft Technologies, which is developing new treatment options for coronary artery bypass surgery, has raised over $34 million in funding to date. Dr. Wagner has 26 issued patents and 27 additional patent filings to his name. Wagner and his colleagues’ most recent invention includes a fluid material that gels upon injection into tissues and then acts to control inflammation and direct tissue healing. Wagner has also invented a series of new biodegradable, elastic polymers that can be used to slow the dilatation of the heart following a heart attack as well as be used in other applications, such as creating heart valves. Mast cells play a key role in the inflammatory process. A mast cell is a myeloid derived cell and is part of the immune system. Mast cells contain many distinctive granules rich in histamine and heparin. Although best known for their role in allergy and anaphylaxis, mast cells play an important protective role as well, being intimately involved in angiogenesis, and defense against pathogens, and wound healing. Toluidine blue is one of the most common stains for acid mucopolysaccharides and glycoaminoglycans, which are both components of mast cells granules. You’ll receive 20% off Toluidine Blue Staining for the entire month of May when you mention this ad. Email perezl@upmc.edu or call 412-624-5265. McGowan Institute for Regenerative Medicine affiliated faculty member John Kellum, MD, professor in the Departments of Critical Care Medicine, Medicine, Bioengineering, and Clinical and Translational Science at the University of Pittsburgh, director of the Center for Critical Care Nephrology and the vice-chair for research, and associate director for acute illness in the Institute for Personalized Medicine at Pitt, weighed in on the results. “We’ve been sounding the alarm for 20 years” about possible harms from saline, said Dr. Kellum. “It’s purely inertia” that prevents a change, he said. Dr. Kellum had no role in the studies, which were discussed recently at a critical care conference in San Antonio and published by the New England Journal of Medicine. Federal grants helped pay for the work. 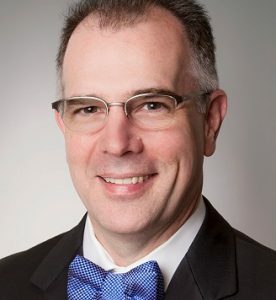 Since there are about 30 million people hospitalized in the U.S. alone each year, “there are tens or hundreds of thousands of patients who would be spared death or severe kidney problems by using balanced fluids instead of saline,” said one study leader, Vanderbilt’s Matthew Semler, MD. After seeing the results two months ago, Vanderbilt hospital officials decided to primarily use balanced fluids. The University of Pittsburgh also has largely switched to them, Dr. Kellum said. Illustration: PrintrBot Simple Metal modified with the LVE for FRESH printing. Source: Dr. Adam Feinberg/HardwareX. The Pittsburgh Atlas, published recently in the Annals of Emergency Medicine, creates the framework that will allow states and groups of counties to implement quality improvement programs accountable to regional performance measures instituted by state and local governments. The Pittsburgh Atlas was partially inspired by the Dartmouth Atlas of Health Care, a set of geographic regions based on Medicare and Medicaid hospital discharge claims that was created more than 20 years ago and is used for epidemiological studies that compare the cost, quality and consumption of health care in different parts of the country. However, the Dartmouth Atlas doesn’t respect state or county boundaries – resulting in a set of regions that do not promote coordination or accountability. Dr. Wallace and his team built the Pittsburgh Atlas by looking at nearly 731,000 Medicare patients who sought care for a heart attack, stroke or moderate to severe trauma in 2011. Referral regions were created by combining patient home counties to hospital counties, allowing multiple patient home counties to join to the same hospital county. 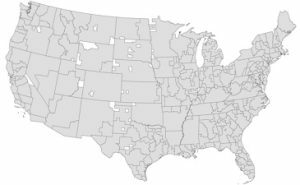 For example, the region containing Pittsburgh (dubbed “57”) consists of 22 counties stretching up the western side of Pennsylvania. It’s one of 16 referral regions in the state. Dr. Wallace and his team have made the data files for the Pittsburgh Atlas available so others can use it for projects that evaluate regional care delivery and seek to improve quality. “This project gives researchers, policymakers, hospital systems and public health agencies a way to move beyond simply comparing apples to apples, and into thinking about orchards,” Dr. Wallace said. Illustration: This map shows the 326 referral regions in the Pittsburgh Atlas. Credit: Dr. David Wallace/Pitt. Direct Lisfranc injuries are usually caused by a crush injury, such as a heavy object falling onto the midfoot, or the foot being run over by a car or truck, or someone landing on the foot after a fall from a significant height. Indirect Lisfranc injuries are caused by a sudden rotational force on a plantar flexed (downward pointing) forefoot. Examples of this type of trauma include a rider falling from a horse but the foot remaining trapped in the stirrup, or a person falling forward after stepping into a storm drain. In athletic trauma, Lisfranc injuries occur commonly in activities such as windsurfing, kitesurfing, wakeboarding, or snowboarding (where appliance bindings pass directly over the metatarsals). American football players occasionally acquire this injury, and it most often occurs when the athlete’s foot is plantar flexed and another player lands on the heel. This can also be seen in pivoting athletic positions such as a baseball catcher or a ballerina spinning. “Anyone who is doing a lot of high-impact running and jumping, there is a risk there,” said Dr. Hogan. Treatment options include operative or non-operative. If the dislocation is less than 2 mm, the fracture can be managed with casting for six weeks. The patient’s injured limb cannot bear weight during this period. For severe Lisfranc injuries, open reduction with internal fixation (ORIF) and temporary screw or Kirschner wire (K-wire) fixation is the treatment of choice. The foot cannot be allowed to bear weight for a minimum of six weeks. Partial weight-bearing may then begin, with full weight bearing after an additional several weeks, depending on the specific injury. K-wires are typically removed after six weeks, before weight bearing, while screws are often removed after 12 weeks. Recently, one of Dr. Hogan’s 16-year-old patients underwent surgery to repair her Lisfranc injury. Today, after surgery and months of physical therapy she is back on the soccer field. “She was young, athletic, very strong. The chances of her returning were higher,” Dr. Hogan said. Lee Fisher, PhD, assistant professor of physical medicine and rehabilitation, and McGowan Institute for Regenerative Medicine affiliated faculty member Doug Weber, PhD, associate professor of bioengineering, were one of four University of Pittsburgh teams to receive a $5.3 million National Institutes of Health (NIH) BRAIN award. The team’s objectives are to 1) explore the effects of electrically stimulating the dorsal root ganglia and dorsal rootlets to generate sensations and reduce phantom limb pain, 2) characterize the responses to electrical stimulation in both the intact and amputated limbs to coordinate reflexes and improve movement, and 3) use electrical stimulation to decrease postural sway and increase gait stability. 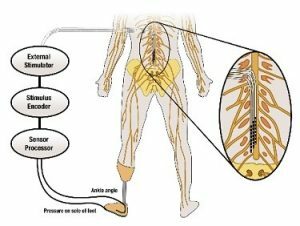 According to Dr. Fisher, making improvements in the sensory feedback of prosthetic devices could drastically improve the quality of life for their users by reducing phantom limb pain, increasing balance control and confidence, and making the prosthetic limb feel more natural. Illustration: Schematic of the approach for providing sensory feedback. University of Pittsburgh Swanson School of Engineering. McGowan Institute for Regenerative Medicine affiliated faculty member and Duquesne University Professor Jelena Janjic, PhD, has created the first inflammatory pain nanomedicine that could significantly reduce the need for opioids in treating pain. Presenting her findings recently at the American Pain Society Scientific Summit, Dr. Janjic reported that nanomedicines, which carry miniscule amounts of drugs, reduced pain behavior after a single injection for one week to one month in rats and mice with diverse types of injury. The nanomedicines carry 2,000 times less medicine than a typical dose, which could reduce the need for opioids in treating various types of pain, including after injury, surgery or even cancer. A chronic pain patient herself, Dr. Janjic’s refusal to take opioids as part of her treatment pushed her to start conducting her own pain research and founding the CPRC in 2011. Co-led with McGowan Institute affiliated faculty member and Duquesne Biological Sciences Professor John Pollock, PhD, the consortium is an interdisciplinary initiative that includes Duquesne faculty and students from the pharmacy, chemistry, nanotechnology, psychology, nursing, neuroscience and occupational therapy fields. CPRC has built significant momentum in recent years, receiving more than $3 million in external funding for research and education programs. Dr. Janjic’s research has been funded by the National Institute on Drug Abuse, the National Institute of Biomedical Imaging and Bioengineering, and the U.S. Air Force. Her highly multidisciplinary team of collaborators includes researchers from Duquesne, the University of Pittsburgh, Wake Forest Institute of Regenerative Medicine, the University of Texas in Dallas and the 59th Medical Wing of the U.S. Air Force. At Children’s, the Citrones’ gift will foster collaboration among pediatric transplant programs with the goal of sharing best practices and clinical data to better standardize care and improve outcomes for children from throughout the U.S. who receive a transplant. This effort will be named in honor of UPMC surgeon Thomas E. Starzl, MD, the father of modern transplantation. “We are honored to support Children’s Hospital and build upon their transformative work in transplantation, giving children the opportunity to live a full life,” said Rob and Cindy Citrone. Illustration: Play It Forward Pittsburgh. This year’s Pittsburgh Life Sciences Week (April 16-20) brought together a diverse mix of life sciences groups, researchers, entrepreneurs, large corporations, and investors to connect and engage across the spectrum, from development in the lab to delivery in the marketplace, and to foster the integration of science and business that will accelerate innovation and translate research into commercial opportunities. Description: Visit the McGowan Institute to tour the Biological Scaffolds for Tissue Engineering Lab (Stephen Badylak, DVM, PhD, MD), Cardiac Tissue Engineering Lab (William Wagner, PhD), Temporomandibular Joint (TMJ) Repair Lab (Bryan Brown, PhD), and Thoracic Aortic Disease Lab (Julie Phillippi, PhD). 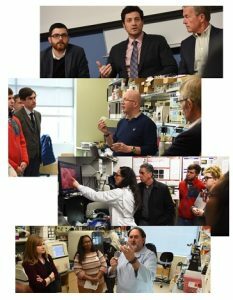 Following the tour, hear about recent spin-outs by McGowan Institute affiliated faculty including LyGenesis (Liver Therapy—Eric Lagasse, PharmD, PhD; Michael Hufford, PhD, CEO), Renerva (Nerve Regeneration—Bryan Brown, PhD; Lorenzo Soletti, PhD, CEO), and Restoure (Esophageal Repair—Stephen Badylak, DVM, PhD, MD; Paul Fagan, CEO). Description: Visit the new LifeX facility in Pittsburgh’s Strip District and celebrate with LifeX team and portfolio company CEOs. LifeX is a US-based biotechnology commercialization platform to deliver first-in-class products to the market to alleviate suffering and death caused by large global unmet health needs such as cancer, Alzheimer’s disease, diabetes, etc. The platform is comprised of LifeX Labs, Life X Seed, LifeX Capital and LifeX Portfolio. Description: Hear from Founding Director and VA Senior Research Career Scientist, Rory Cooper, PhD, and tour HERL’s extensive lab space which includes a clinical laboratory, a robotics laboratory, and a prototyping and testing facility. HERL is at the forefront of assistive technology research seeking solutions to mobility problems for veterans and all people with disabilities using state-of-the-art laboratories and research instruments. HERL’s research encompasses a wide spectrum of the most up-to-date technology, from virtual reality experiments to electronics work with robotics to 3D computer modeling, printing, and machining. 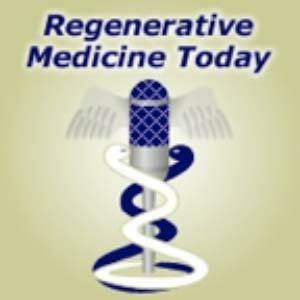 Illustration: Tom Altany, University of Pittsburgh. McGowan Institute for Regenerative Medicine faculty member Bernard Costello, MD, DMD, professor of oral and maxillofacial surgery, has been named dean of the University of Pittsburgh School of Dental Medicine, Pitt’s Senior Vice Chancellor for the Health Sciences Arthur Levine announced recently. Dr. Costello has been serving as interim dean since February 2018 and will begin his deanship on April 1. Dr. Costello joined Pitt’s faculty in 2001 in the Department of Oral and Maxillofacial Surgery and he has served as the School’s associate dean for faculty affairs and senior associate dean. He directed translational research for the School of Dental Medicine and the oral and maxillofacial surgery residency program until 2016 and he remains the fellowship director for pediatric craniomaxillofacial surgery. Dr. Costello is chief of both the Division of Craniofacial and Cleft Surgery in the School of Dental Medicine and the Division of Pediatric Oral and Maxillofacial Surgery at Children’s Hospital of Pittsburgh of UPMC. “We are fortunate that our own faculty member, with years of commitment to his School, to our University and to our medical center, and who is recognized nationally and internationally for his research and clinical and educational achievements, has chosen to serve as our dean,” said Dr. Levine, who is also the John and Gertrude Petersen Dean of Pitt’s School of Medicine. 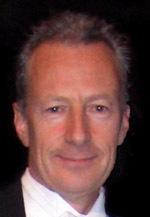 Throughout his career, Dr. Costello has been published extensively and secured more than $6.6 million in grants and funding for his research, which has focused on bone scaffolding for craniofacial regeneration, the roles of various proteins in craniofacial regeneration and other aspects of bone tissue engineering. Dr. Costello’s tenure as dean follows that of Thomas W. Braun, who retired recently after serving as dean for 18 years and spending his entire postsecondary education and career at Pitt. The School of Dental Medicine provides comprehensive clinical care, including the Multidisciplinary Implant Center and the Center for Patients with Special Needs, one of the few centers in the U.S. dedicated to training future dentists to care for patients with disabilities. Recognized for excellence in research, the School of Dental Medicine is a top tier ranked National Institute of Dental and Craniofacial Research institution. At the 2018 Orthopaedic Research Society (ORS) Annual Meeting in New Orleans, the organization recognized its inaugural class of ORS Fellows, among them McGowan Institute for Regenerative Medicine faculty member Savio L-Y. 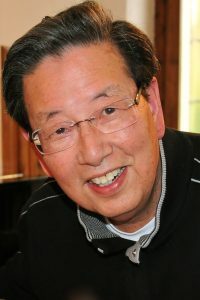 Woo, PhD, DSc, DEng, Distinguished University Professor Emeritus of Bioengineering and Director of the Musculoskeletal Research Center (MSRC) at the University of Pittsburgh. ORS Fellows are recognized for their significant contributions to the field of musculoskeletal research and the ORS. As a leader in bioengineering and orthopaedics research at Pitt’s Swanson School of Engineering, Dr. Woo has educated over 500 students and mentored 37 junior faculty. Dr. Woo established the MSRC in 1990 for education and research in orthopaedics. It has matured into a multidisciplinary effort that teaches and mentors highly qualified students, fellows, and residents. The MSRC laboratories cultivate a collaborative community to perform research at the molecular, cellular, tissue, and joint levels. As an ORS Fellow, Dr. Woo will continue to advance musculoskeletal research and support the ORS mission. Fellows are leaders in their discipline and foster knowledge in their field and the ORS community through education, programming, and collaboration. Lance A. Davidson, PhD (center), Professor, Department of Bioengineering, University of Pittsburgh, for seminal contributions to developmental biomechanics, establishing theoretical frameworks and experimental techniques to expose design principles. Richard E. Debski, PhD (right), Professor of Bioengineering and Orthopaedic Surgery, Department of Bioengineering, University of Pittsburgh, for outstanding contributions in bioengineering research, particularly in the area of biomechanics of shoulder and knee joints. Jonathan Vande Geest, PhD (left), Professor, Bioengineering, University of Pittsburgh, for outstanding contributions to the educational and scientific advancement of experimental and computational soft tissue biomechanics. A formal induction ceremony was held during the AIMBE Annual Meeting at the National Academy of Sciences in Washington, DC, on April 9, 2018. These professors were inducted along with 156 colleagues who make up the AIMBE College of Fellows Class of 2018. Congratulations, Drs. Davidson, Debski, and Vande Geest! The Carnegie Science Center established the Carnegie Science Awards program in 1997 to recognize and promote outstanding science and technology achievements in western Pennsylvania. The Carnegie Science Awards have honored the accomplishments of more than 550 individuals and organizations whose contributions in the fields of science, technology, and education have impacted our region’s industrial, academic, and environmental vitality. 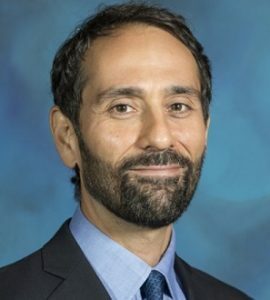 The 22nd Annual Carnegie Science Awards celebration will be held on May 4, 2018, at Carnegie Music Hall in Oakland during which time McGowan Institute for Regenerative Medicine affiliated faculty member Antonio D’Amore, PhD, will be presented with an Honorable Mention Award in the Advanced Manufacturing and Materials Category for his tremendous work and its impact on the vitality in the region. The Advanced Manufacturing and Materials Award recognizes accomplishments in the areas of manufacturing and materials processes which have led to significant business, economic, or societal benefits for the region. The Team of Dr. D’Amore, William Wagner, PhD, and Vinay Badhwar, MD, has pioneered the development of synthetic polymer scaffolds where the designer can “dial-in” the magnitude of important scaffold parameters, such as strength, rate of degradation rates, porosity, and microstructure, as well permit the fabricate complex shapes and sizes required for critical applications. This is a game-changing outcome. Using this platform technology, the Team has shown that a tissue engineered heart valve may be a viable alternative to other “replacement valves” available or that are being considered. 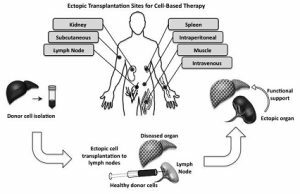 This work has enhanced the visibility and the reputation of the region as a “hub” for tissue engineering, and has been a mechanism for increased grant support for the region. The research by the Team has resulted in a significant enhancement in the ability of scientists to produce polymer scaffolds with important characteristics that can be managed during the production of the scaffold. The ability to “dial-in” the magnitude of important parameters is a game-changing outcome. This research has helped to enhance the reputation of the region as a pioneer in tissue engineering. While much work needs to be done before it will be safe to use a tissue engineered heart valve in a human (a heart valve needs to work flawlessly ~1/second…for many years), the Team has defined the technology and a pathway to realize that outcome. Residents, fellows, postdocs, and medical students filed into the University Club to compete in the American Heart Association’s (AHA’s) 26th Annual Fellows Research Day poster session. 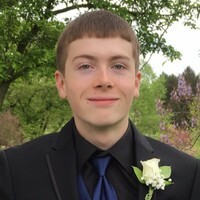 Among this group of accomplished young researchers was Trevor Kickliter, a mechanical engineering sophomore in the University of Pittsburgh Swanson School of Engineering. Mr. Kickliter works in the lab of McGowan Institute for Regenerative Medicine affiliated faculty member David Vorp, PhD, Associate Dean for Research and the John A. Swanson Professor of Bioengineering, where he uses commercial and custom-built software to study vascular diseases. On a whim he decided to pick up some research that had been put on the back-burner, and what started as a side project in the lab turned out to yield interesting results that intrigued some of Dr. Vorp’s cardiologist collaborators. Mr. Kickliter joined a group of researchers and began to look at how to detect reductions in the coronary arteries of pediatric patients. Other members of the research team include Aneesh Ramaswamy, a bioengineering graduate student researcher in the Vorp Lab; Brian Feingold, MD, a pediatric cardiologist at UPMC; and Justin Weinbaum, PhD, research assistant professor of bioengineering at Pitt and McGowan Institute affiliated faculty member. Excited by the promising results, Dr. Feingold encouraged Mr. Kickliter to submit an abstract to the AHA’s Fellows Research Day. The event’s poster session was judged by some of the region’s leading physicians and scientists. Though he faced competition from more experienced researchers, Mr. Kickliter, one of the youngest participants, won 2nd place and $250 in the clinical science category. Mr. Kickliter and the other award winners were acknowledged at the Pittsburgh Heart Ball on Saturday, February 17, 2018 at the Pittsburgh Wyndham Grand Hotel. And 13 of the 40 finalist teams celebrated sharing the $100,000 in prize money. This year’s competition was the largest yet, with more than 300 students of all levels, from freshman to doctoral, participating in the initial round comprising more than 100 teams. Teams led by University of Pittsburgh Swanson School of Engineering students captured at least one win in every place. Dr. Van der Merwe graduated in April with her PhD in Bioengineering from the University of Pittsburgh. Her dissertation research focused on improving vision after ocular trauma by utilizing extracellular matrix (ECM) components to reduce the inflammatory response and improve retinal neuron survival and function after injury. 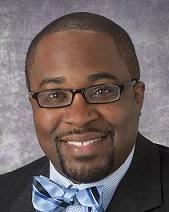 Mr. Murdock is a graduate student in the Department of Pathology at the University of Pittsburgh. His research projects involve a collaboration with the laboratory of Kyle Orwig, PhD, focused on improving reproductive therapies through use of ECM components and his doctoral work in determining the role of the glioma microenvironment in modulating brain-resident macrophages. This years’ competition marked the 10th anniversary and it included the announcement that Pitt trustee Bob Randall and his family are donating $2 million to establish the Big Idea Center at the Innovation Institute to support student entrepreneurship. See that full story here. 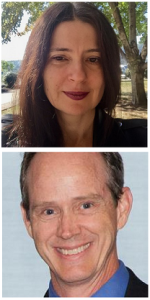 Congratulations, Dr. Van der Merwe and Mr. Murdock! 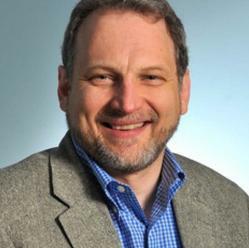 #182 –– Dr. Stephen Badylak is the editor-in-chief of the Journal of Immunology and Regenerative Medicine. Dr. Badylak discusses the new journal, which debuted on April 26, 2018. Summary: Syringe pump extruders are required for a wide range of 3D printing applications, including bioprinting, embedded printing, and food printing. However, the mass of the syringe becomes a major challenge for most printing platforms, requiring compromises in speed, resolution and/or volume. To address these issues, we have designed a syringe pump large volume extruder (LVE) that is compatible with low-cost, open source 3D printers, and herein demonstrate its performance on a PrintrBot Simple Metal. 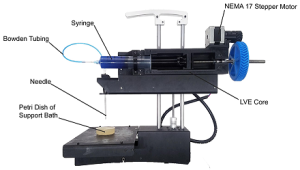 Key aspects of the LVE include: (1) it is open source and compatible with open source hardware and software, making it inexpensive and widely accessible to the 3D printing community, (2) it utilizes a standard 60 mL syringe as its ink reservoir, effectively increasing print volume of the average bioprinter, (3) it is capable of retraction and high speed movements, and (4) it can print fluids using nozzle diameters as small as 100 μm, enabling the printing of complex shapes/objects when used in conjunction with the freeform reversible embedding of suspended hydrogels (FRESH) 3D printing method. Printing performance of the LVE is demonstrated by utilizing alginate as a model biomaterial ink to fabricate parametric CAD models and standard calibration objects. Source: HardwareX. 2018 April; v3, 49-61.